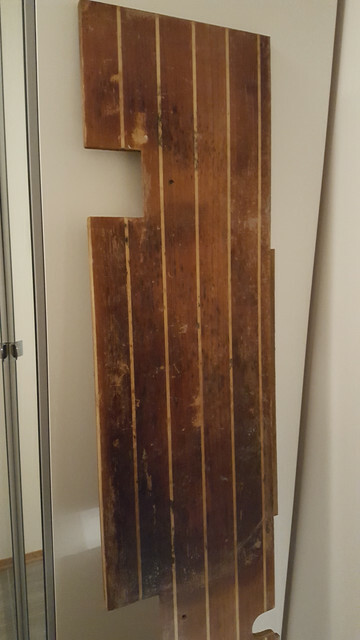 I have a veneer teak flooring in pretty bad shape (see the pictures). Does anyone have experience refurbishing teak veneer in this condition? I pulled all my floorboards on a Catalina 36, lightly sanded and put three coats of polyurethane. Looked great, I thought. If your material is too thin to sand out the defects/damage you'll probably need to buy new plywood and use the old piece for a pattern. Light sanding is not going to remove all the embedded dirt (and oil?) in OP's floor. You could try Tekka A&B, I hope somebody has a better suggestion. True! Stripped them first, then sanded. He might try some deck stripper like oxalic acid. 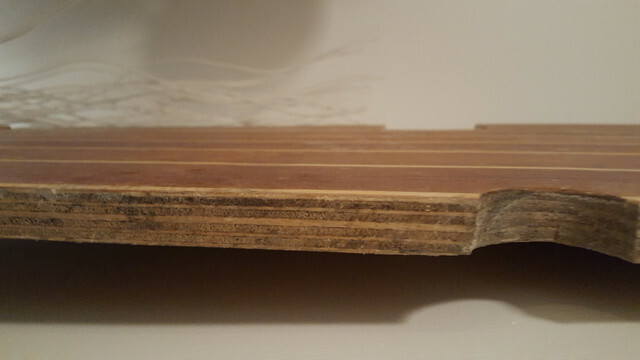 But if the stains are deep and the veneer thin, it's time for a new board. There's your better suggestion.! Gackkk! Teka will almost surely kill the veneer. I'd say don't even think about this one!